Xmas in July is a time to take a small holiday and put distance between us and our qualms. It's a time to get warm and fuzzy with kindred spirits and mates. Each year we hold our very own Xmas in July where we hire an entire private boutique hotel in the Blue Mountains and continue this joyful tradition. The Mount Victoria Manor has undergone substantial renovations just in time for our Xmas in July tradition. Join us for our 7th Annual Xmas in July. We offer you 2 OR 3-night accommodation in the manor with a full breakfast for each morning. 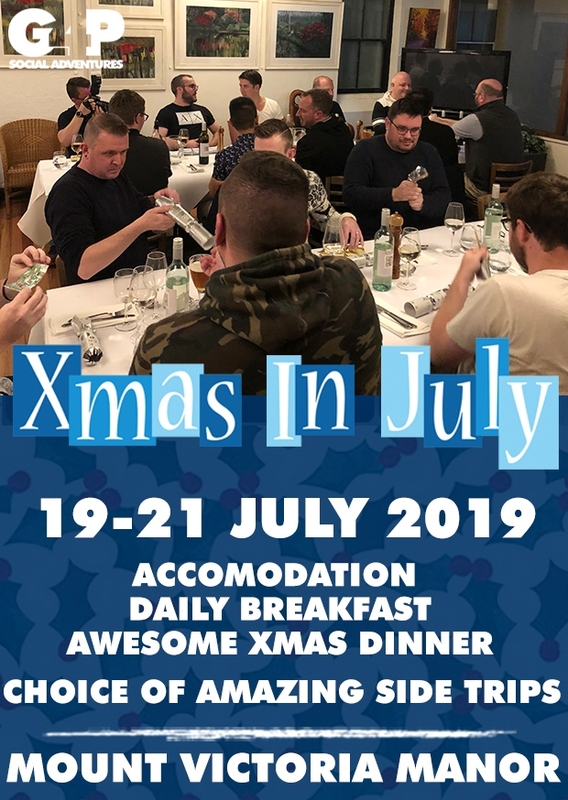 The Xmas in July dinner on Saturday night includes freshly mulled wine, a traditional Xmas dinner, as well as delectable table wine with the meal. All this and the joy and ambience G4P continues to deliver from $540 per person. Add it up! You won't find a better deal with such an amazing group of people. Your choice of driving yourself or purchasing a transfer package allows the freedom or camaraderie you prefer for your weekend away in the mountains. After stopping in Lithgow for lunch (included) we drive to begin our walk from the car park along the old railway formation to the tunnel which has cool vegetation change to the dry open landscape of the plateau. Large tree ferns and treecreepers line the route. Along the way, you pass through spectacular rock formations. The tunnel is some 400m long and the glow worms become more apparent the further away from daylight you go. Towards the middle of the tunnel, turn off your torch and allow your eyes to adjust to seeing the glow worms. There are a variety of walking tracks in the area. You can continue through the Glow Worm Tunnel following the Wolgan Valley railway formation towards Newnes. Around 5km in we will double back and begin our return journey back to the Mount Victoria Manor. Featuring majestic and panoramic views overlooking the Megalong Valley the Hydro Majestic is one of Australia’s most iconic historical hotels. With its understated elegance and warm ambience featuring plush furnishings, fireplace, and charming artworks. A selection of steamed eastern dumplings, crab claw, prawn and vegetarian rice paper roll, soft taco with pork belly and a selection of eastern and western desserts and your choice of tea or coffee. Both served with a flute of sparkling wine. The Blue Mountains is home to 2 great wineries and we will explore BOTH for a fabulous afternoon of lunch and wine tastings. We will visit the Megalong Creek Estate and Dryridge Estate. Both have some amazing cellar door only wines and you are in for an afternoon of taste sensations of both liquid and solid varieties. Japan and Korea are renowned for their professional spas and natural herbal steam baths. Allow yourself to breathe deep and let the magic exhilarate both your body and soul. Honestly, this is the kind of relaxation you won't find in the city. After cleansing your body, lie back in the beautiful Japanese Zen garden to admire the contemplative and subtle designs. You'll love to take a walk on the reflexology path as you give yourself a foot massage exactly as you want it: taking a step at a time. Let's not forget the ultimate luxury of a dip either in our outdoor hot spring bath or the indoor spa. Experience first-hand, the wonders of the purest natural underground spring water alongside a breathtaking view of the blue mountains. Euroka prides themselves on quality horses, equipment, and friendly, personalised service. The horses are educated and healthy, willing and cooperative, making your ride the relaxed and enjoyable experience it should be. On arrival, you will be matched with a horse to suit your experience. A short riding assessment and basic tutorial will be given in the arena before heading out on all rides. Get the day underway with a hearty pub lunch just outside Lithgow before heading on to Jenolan Caves for a 2hr cave exploration. This long and exciting cave tour rewards you with a sense of personal achievement. Its many astonishing features make the effort worth while. It offers something to amaze everyone. It features the underground ‘River Styx’ which appears as pools of blue water, including the ‘Pool of Reflections’. This is a deep, illuminated underground lake, whose almost motionless surface produces spectacular reflections. You will see the huge 'Queen Esther's Chamber', magnificent shawls, such as the ‘Giant Shawl’, and many famous formations, including the ‘Minaret’ (a spectacular stalagmite), ‘Grand Column’ (biggest column at Jenolan) and the ‘Queen's Canopy’. This tour includes 2 high, steep steel ladders. Please wear appropriate shoes and clothing. What's Xmas without presents? Who doesn't love a clever or thoughtful gift to reclaim back home? We ask that you share in the joy of the occasion by bringing a $25 Kris Kringle gift to put into the fold so everyone can get a present that night. Last year, we had a very eager Santa deliver the presents. Who's been naughty or nice this year? Yes, you heard right. It has become a tradition in the past few years that we get in touch with our inner child and have a pyjama party in an array of creative onesies. Last year we have unicorns, pandas, Spiderman, minions and more. What will you bring to the party?? The meeting place of the hotel now is the bar which has an amazing atmosphere with a large open fire and many of the rooms have undergone recent upgrades. The hotel continues to improve year on year.